Cobra Labs the Curse Review – Is it effective? The Curse is Cobra Labs’ new pre-workout mix that promises an explosive energy boost as early as 30 minutes after taking the mix. According to Cobra Labs, The Curse is extremely potent, that the user would need to take caution when taking it. After reading Cobra Labs’ word of caution, it was clear that the product is being marketed with the premise that the product is dangerously potent. Hence, anyone who’s hell-bent about achieving results would buy the product, thinking that the risk is about the side effects and not the price. They have the market thinking If it’s dangerously effective, then it should be easy to get results. Just how dangerous and effective is The Curse? We took a closer look into The Curse and compared it with other muscle building supplements to see just how potent the product is. Judging from the reviews, it appears that it’s the taste of The Curse that got people to buy the product for the second time. The taste is a big factor, especially since most pre-workout powders typically taste awful. The Curse is surprisingly palatable. Of course, the flavor is not for everyone. Most fitness buffs are used to the taste of milk-infused flavors like Vanilla and Chocolate, and a fruity flavor like what The Curse has may put off some users. The critical reviews about The Curse helped us understand how it really works on your body. The Curse contains Caffeine, and like any other supplement that contains caffeine, its effects on alertness and focus are immediately noticed. Many users also reported a sharp drop in energy levels about 2 hours after taking The Curse. This can be attributed as well to the Caffeine, which depletes your energy levels so fast that you’re en route to a crash. You can expect a boost in energy right after taking The Curse, but expect that your body will experience a caffeine crash later in the day. 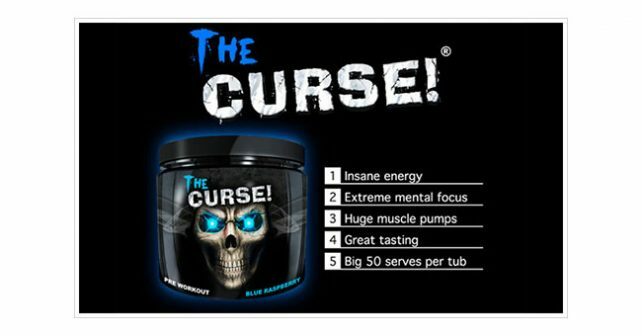 Because of the caffeine crash that many users have experienced, naming the product “The Curse” seems appropriate. The ingredients in The Curse are commonly found in most protein powders and other muscle building supplements. Given these ingredients, it’s ok to assume that as long as these ingredients are taken within its safe range, The Curse is just like any other protein supplement. In fact, adverse caffeine effects from overdose are probably the worst that you could get from this mix. The concentration of caffeine in The Curse is just 145 mg, which is far weaker than other supplements on the market today. Some other supplements in both powder and capsule preparations have far more caffeine content and they don’t go way beyond warning everyone about their product content. The Curse is way overhyped with its warnings about its effect. In all fairness, the caffeine content on The Curse is just as much as two cups of coffee, and that may be the reason why users complain about the caffeine crash. Plus, there’s only so much you can do with little caffeine and creatine. It would have been a lot better if there are more Nitric Oxide-boosting nutrients to help muscle development. The Curse falls flat in comparison with the best muscle building supplements like NitroGenix 365 and Xtreme Testosterone.